Posted on September 10, 2014	by Katy K.
I have queues of books to review and instead have been writing pirate poems for the Talk Like a Pirate Day program I’m running at the library this weekend… but Maggie Stiefvater today is doing a thing where if I tell you why I enjoy the Raven Cycle, I can enter for a chance to win an ARC of Blue Lily, Lily Blue. My friends, I find it easier to explain why I like books than why I love books. The Raven Cycle are books that I have started and been sucked into, had trouble sleeping wondering what would happen to the characters next and dreamed about them when I finally fell asleep. I listen to them as soon as I can get hold of them, and instead of moving smartly on to the next book in my queue when I finish the way I usually do, I go right back to the beginning and start again. In library terms, we talk about “appeal factors” – the different aspects of writing that hook people. The general idea is that people have different tastes, and books with different things done well will appeal to different people. The appeal factors I usually think about are plot, character, setting, and language. A decent author will have at least one of these aspects of a book really well done – your average thriller, for example, will focus on plot, while a literary novel will focus on character or language. If I try to analyze it, I think what I love so much about the Raven Cycle is that all of these aspects are strong – the characters I care about stuck in edge-of-the-seat situations in a vivid place, all told in beautiful language. Plus magic – in this case, Welsh magic, which I love. And seeing as it’s coming from Maggie, there’s always a chance that there will be a HARP in it somewhere. 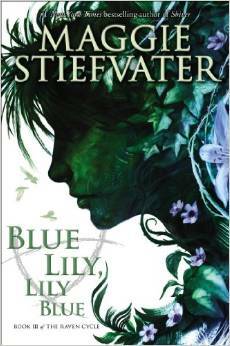 Blue Lily, Lily Blue comes out October 21, and I can’t wait. This entry was posted in Books and tagged teen fantasy. Bookmark the permalink.